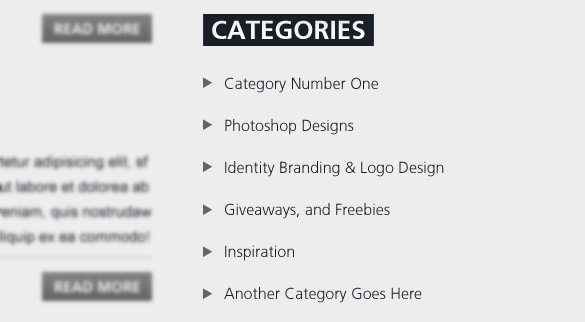 In today’s Photoshop tutorial, we’re going to learn how to create a clean WordPress-styled website/blog design. 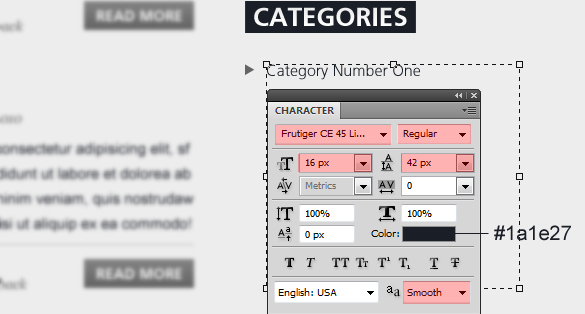 We’ll be mainly dealing with; Basic shapes (lines, rectangles, arrows), Layer Styles, and a bit of basic type. Besides some Photoshop tricks. We’ll also be focusing on keeping our layout very well-aligned. So, let’s get started! Take a quick look at what we’ll be creating together. 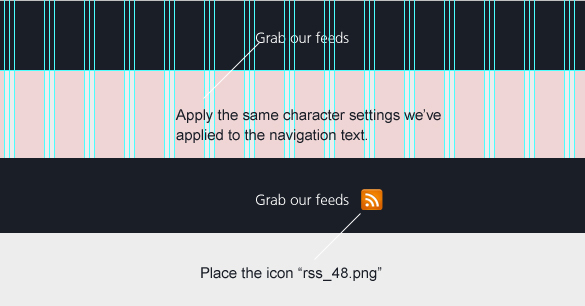 We’ll get the bird and RSS feed icons from Function free icon set. 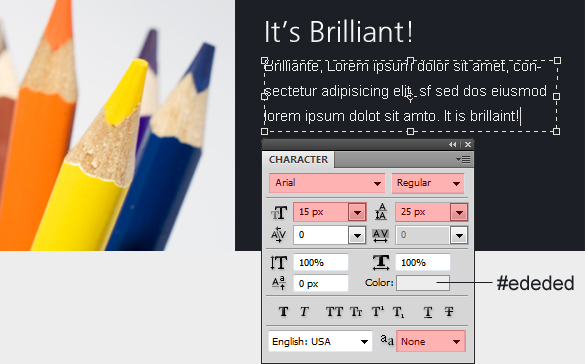 We’ll use Frutiger™ CE 45 Light (Get it from Fonts.com), Arial, and Georgia (both are web-safe/standard fonts). 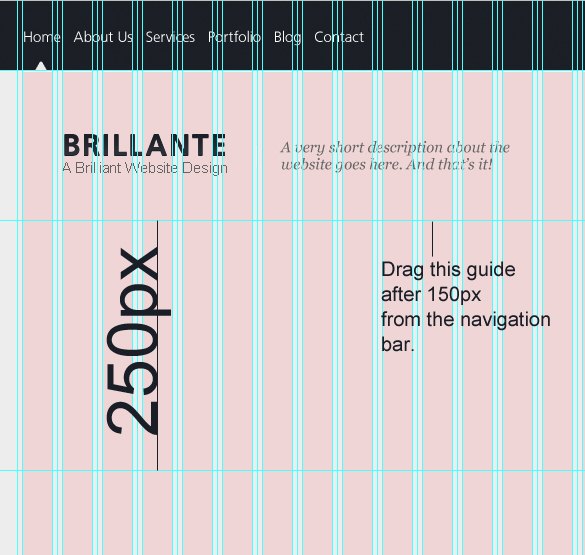 We’ll be using 960 Grid System to keep everything well-aligned. Once it’s downloaded, Open this file “960_grid_24_col” up in Photoshop. The final outcome is taller than the current height. 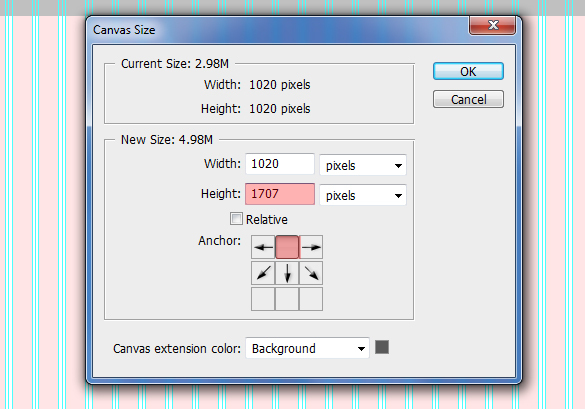 So, we’ll go to Image > Canvas Size > Adjust your options according to the following image. In order to fill our background with a color. 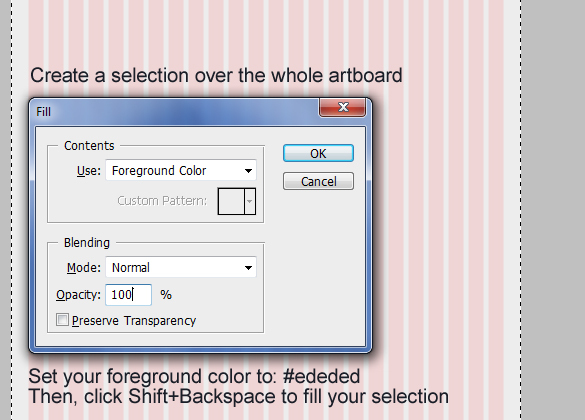 Using the Rectangle Marquee Tool (M) create a selection over the whole artboard, set your foreground color to: #ededed then, click Shift+Backspace to fill your selection. 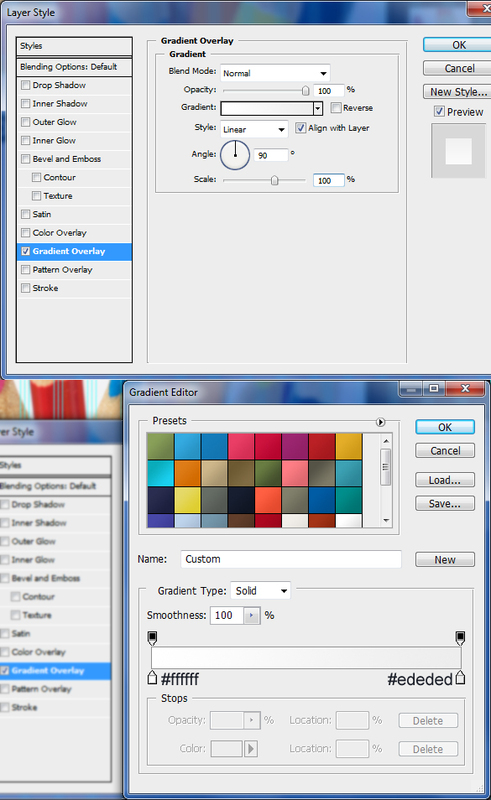 (Make sure to choose “Foreground Color” as a the filling option). 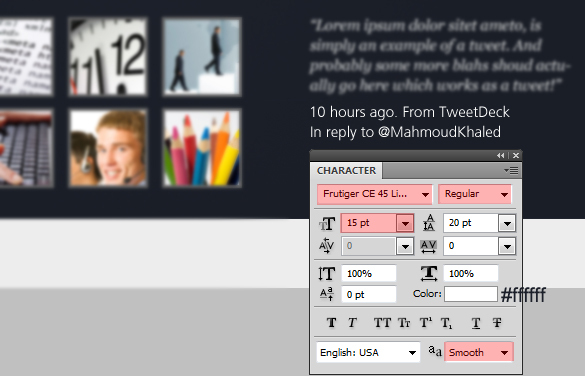 Again, using the Rectangle Marquee Tool (M) create a selection of 1020x70px – This will work as our header background. Fill your selection with this color value: #1a1e27. 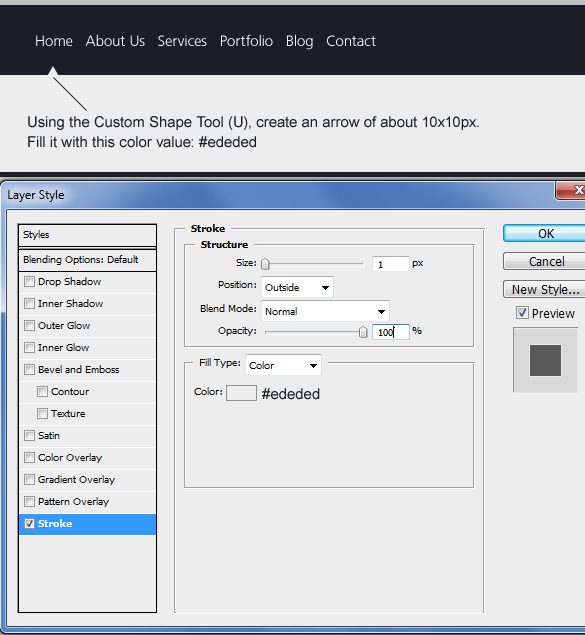 Using the Custom Shape Tool (U) create an arrow of about 10x10px and fill it with #ededed and give it a Stroke. Using the same character settings I’ve shown in the previous step, type “Grab our feeds“. Then from the Function Free Icon Set place the icon “rss_48” next to it. 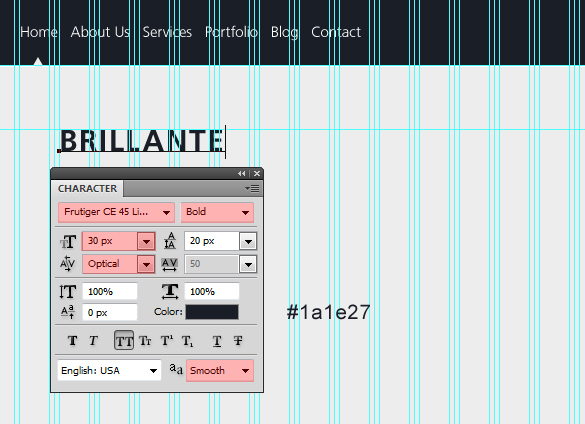 Using the Line Tool (U) create a vertical line of 1px in width. Apply a Gradient Overlay to it. 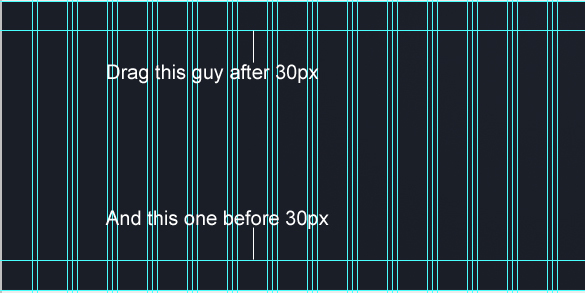 Create another line, move it 1px to the right. Apply a Gradient Overlay to it as well. In order to create our search bar background, use the Rounded Rectangle Tool (U) to create a rectangle of 180x25px with a radius of 5px, and fill it with #ededed. 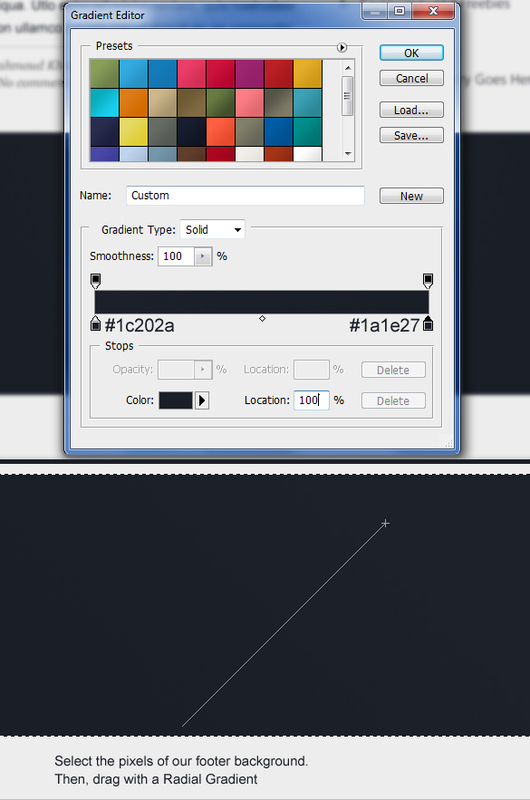 Using the Custom Shape Tool (U) create an arrow of about 15x15px, and fill it with #646464. 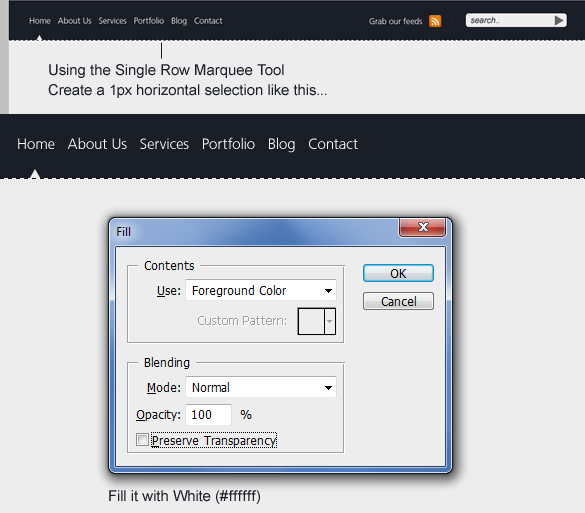 Using the Single Row Marquee Tool create a 1px selection. Fill it with white (#ffffff). 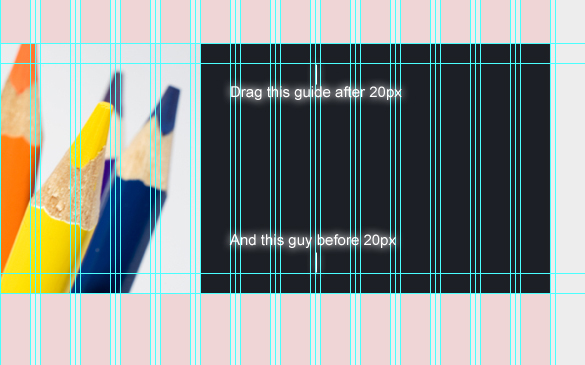 Since this 1px line should appear behind the arrow we’ll load the pixels of the arrow layer (by holding down Ctrl key and clicking on the arrow layer’s thumbnail), then hit Delete while selecting the 1px line layer. 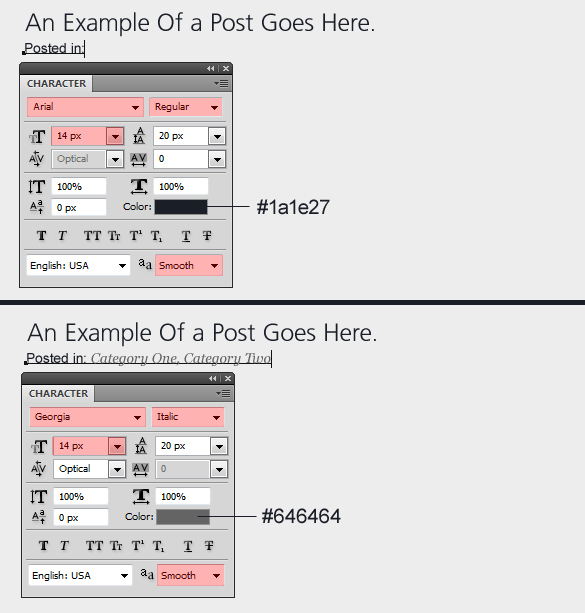 Duplicate the text layer, place it beneath the original one, fill it with white, then nudge it down 1px. 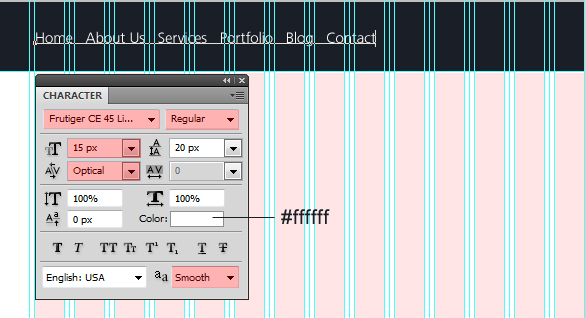 Using the Line Tool (U) create two lines of a width of 1px each. 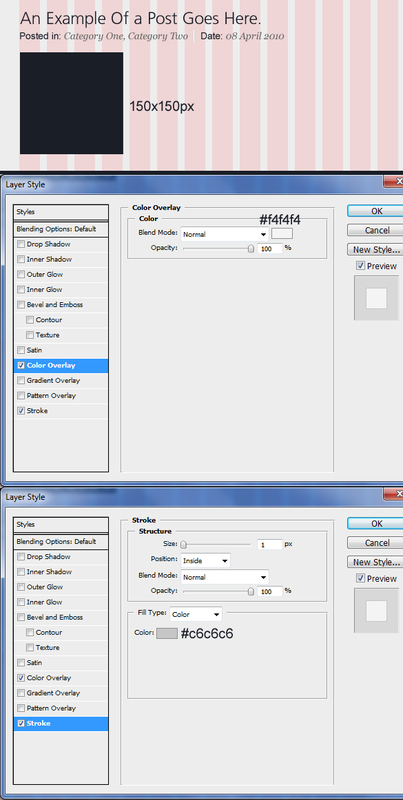 Then fill them with these color values: #ffffff & #d1d1d1. 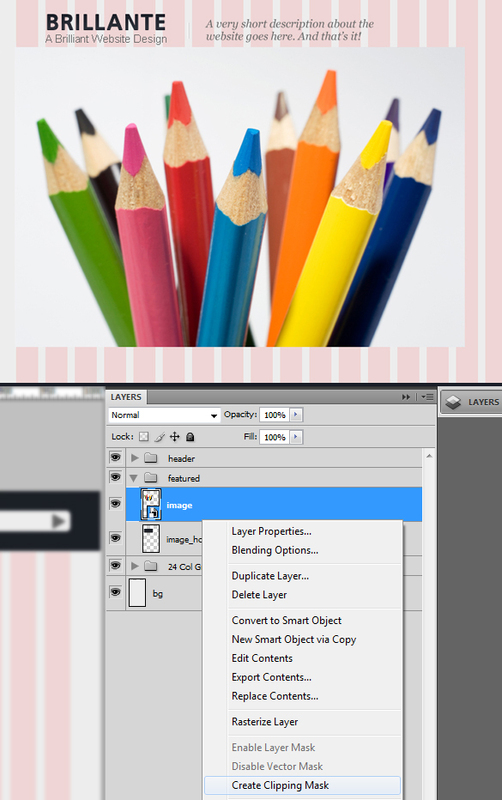 Using the Rectangular Marquee Tool (M) create a selection of 600x250px. Fill it with any color for now. 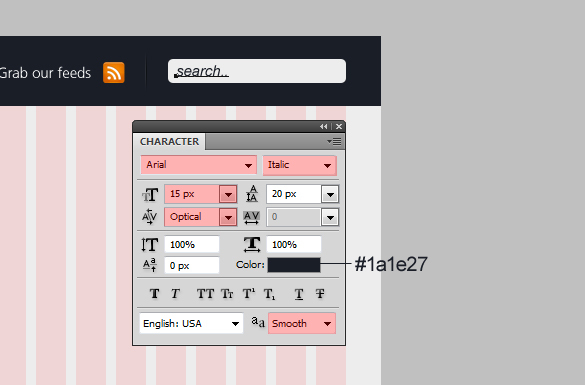 Using the Rectangular Marquee Tool (M) create another selection of 350x250px and fill it with #1a1e27. Using the Line Tool (U) create a line of 320x1px and fill it with #393939. Place an image of your choice, create a clipping mask for it – refer to a previous step on how to do that – then make two more copies of your image. 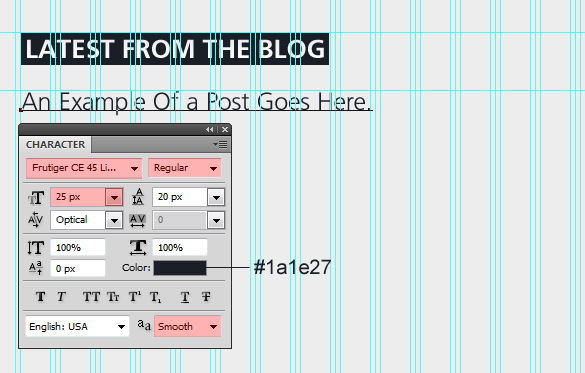 Using the Rectangle Tool (U) create a rectangle of about 110x40px and fill it with #1a1e27. 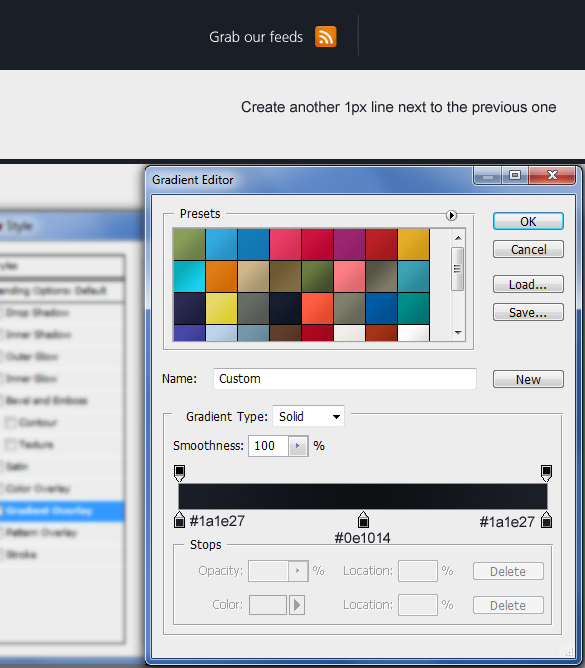 Using the Custom Shape Tool (U) create an arrow of 10x10px and fill it with this color value: #1a1e27. 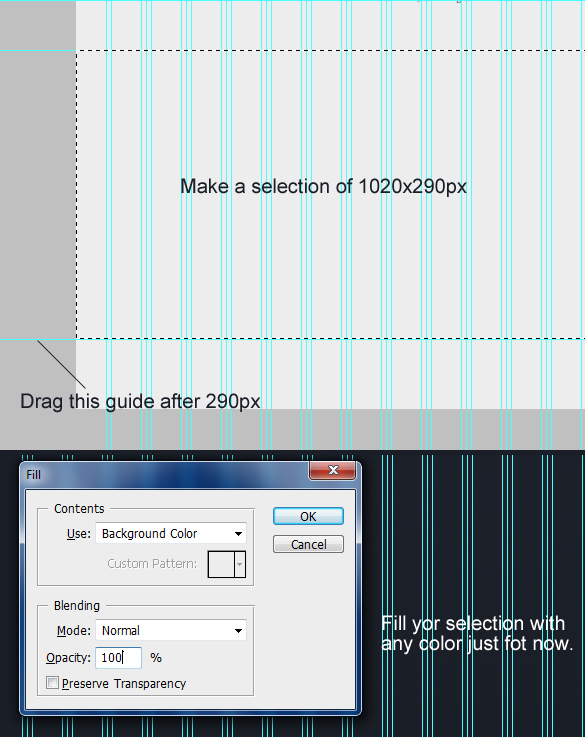 Drag a new horizontal guide after 50px. 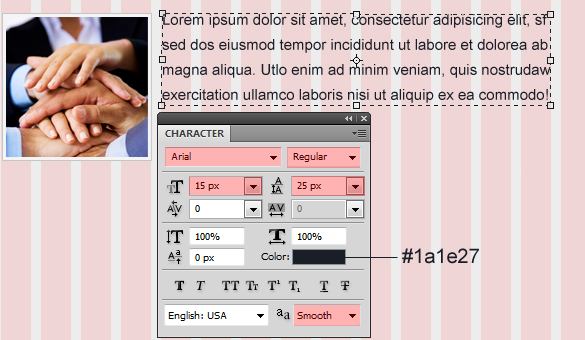 Using the Rectangle Tool (U) create a rectangle of about 310x30px and fill it with #1a1e27. Color: Won’t matter since we’ll apply a Gradient Overlay. 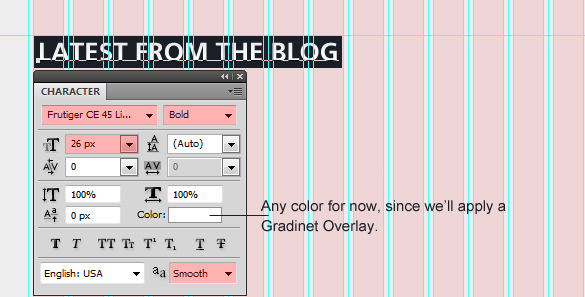 Apply a Gradient Overlay to your text. Use the image below for reference. 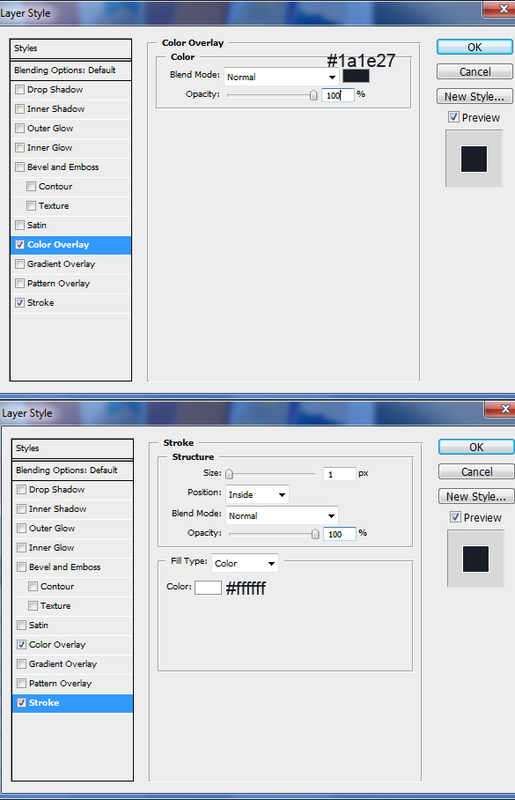 Using the Rectangle Tool (U) create a rectangle of 150x150px. And apply some Layer Style to it. 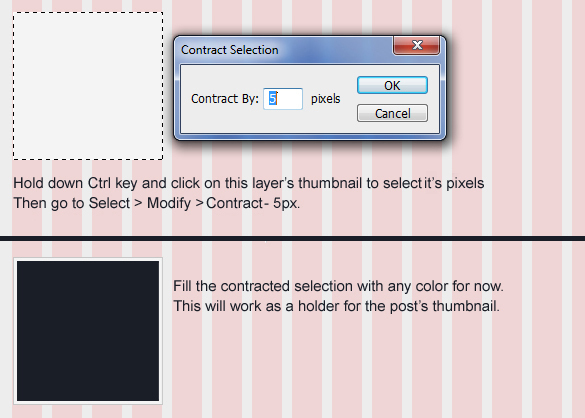 Hold down Ctrl key and click on this layer’s thumbnail to select it. 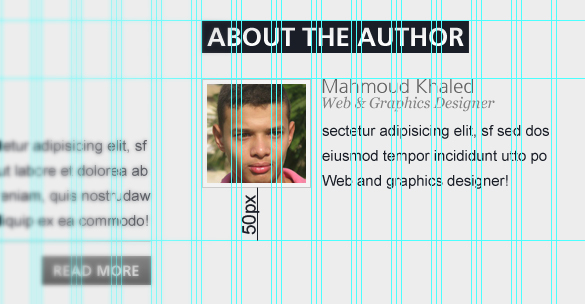 And go to Select > Modify > Contract: 5px. Then fill this selection with any color for now. Place an image. Apply the “Create clipping mask” command to it. 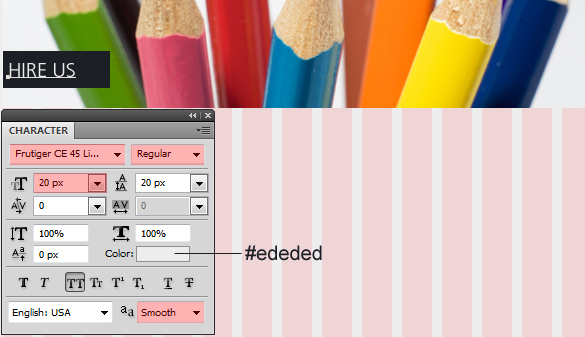 Using the Line Tool (U) create a line of 390×1 and fill it with this color value: #bdbdbd. 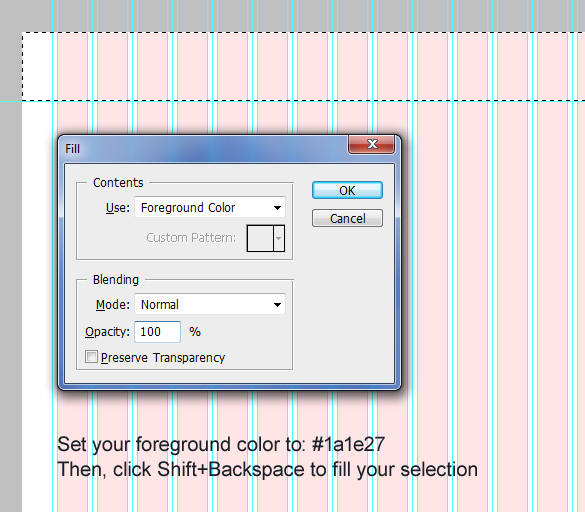 Create a rectangle of 110x30px, and apply a Gradient Overlay to it. 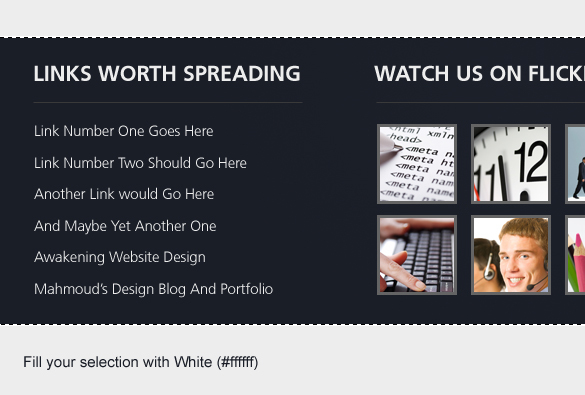 Create two more copies of your latest blog post, and leave 100px between each one. Create a rectangle of 165x165px, and fill it with any color just for now. 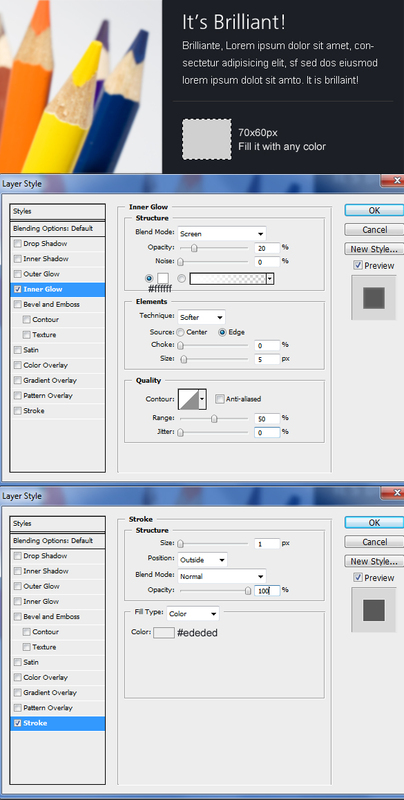 Apply some Layer Styles for it. Check the image below for reference. Color: Any color just for now. 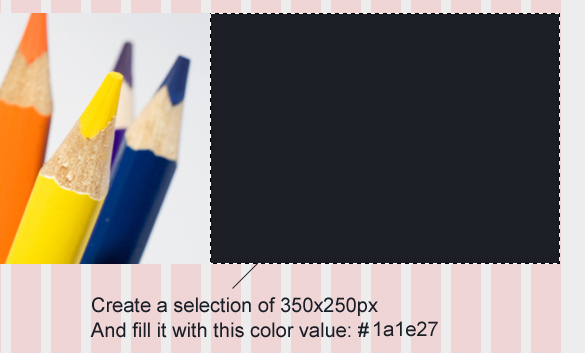 Create an arrow of 10x10px and fill it with this color value: #646464. 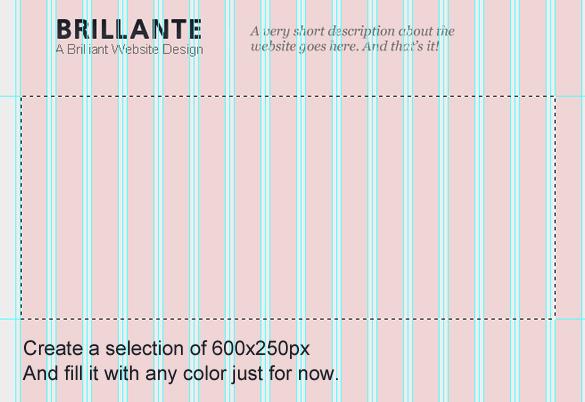 Using the Rectangular Marquee Tool (M) create a selection of 1020x290px and fill it with any color. 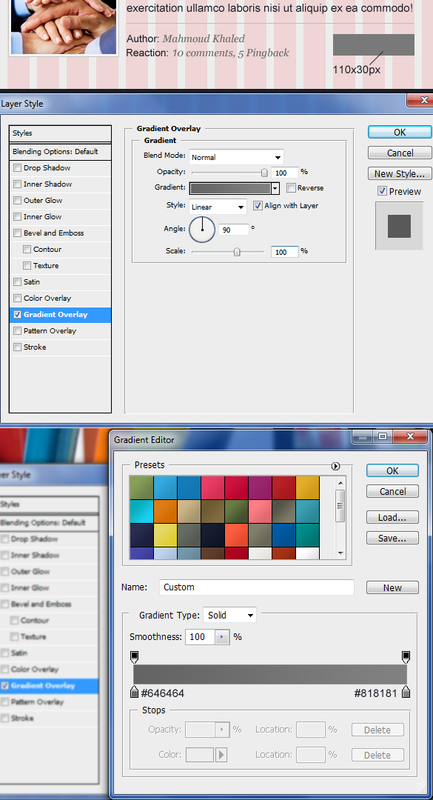 Set the color values in your Gradient Editor from #1c202a to #1a1e27. 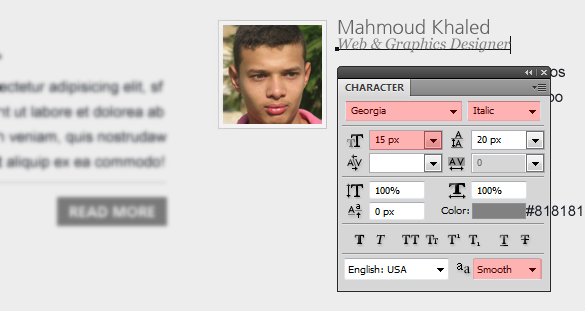 Select the pixels of the footer background layer. 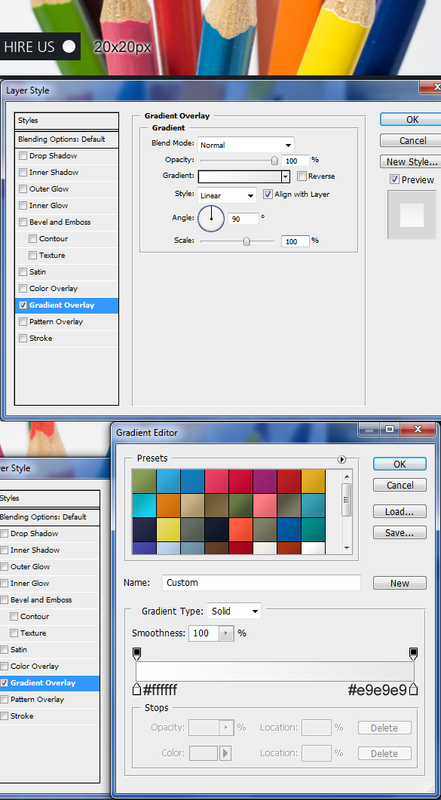 Then drag with a Radial Gradient. 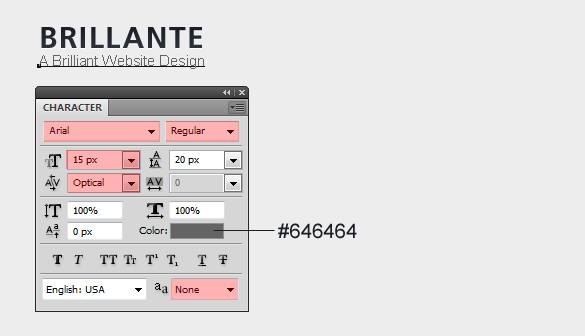 Using the Line Tool (U) create a line of 270x1px and fill it with this color value: #393939. Create another heading. Check the image below for reference. Create a rectangle of 80x80px, fill it with #646464, select its pixels, contract selection, place an image, create a clipping mask for it. We did that previously in another step. Create a one final heading. Check the image below for reference. Place the bird icon from the Function free icon set. 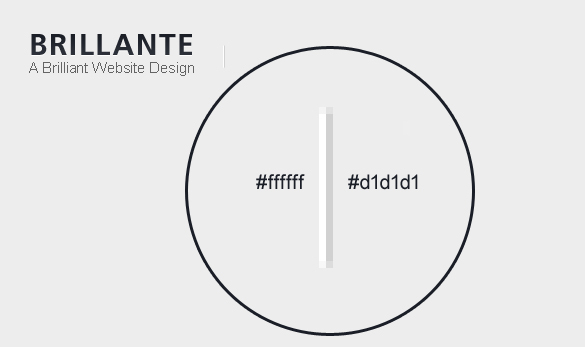 Create two selections of 1px in height for each at the top and the bottom of the footer, then fill them with white (#ffffff). 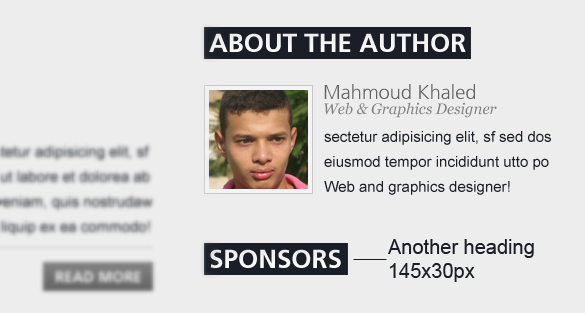 Mahmoud is a young web and graphic designer from Egypt. He’s also a blogger and tutorial writer. Send him a tweet @MahmoudKhaled, connect with him on Facebook, or visit his blog/site called mkhaled.com. 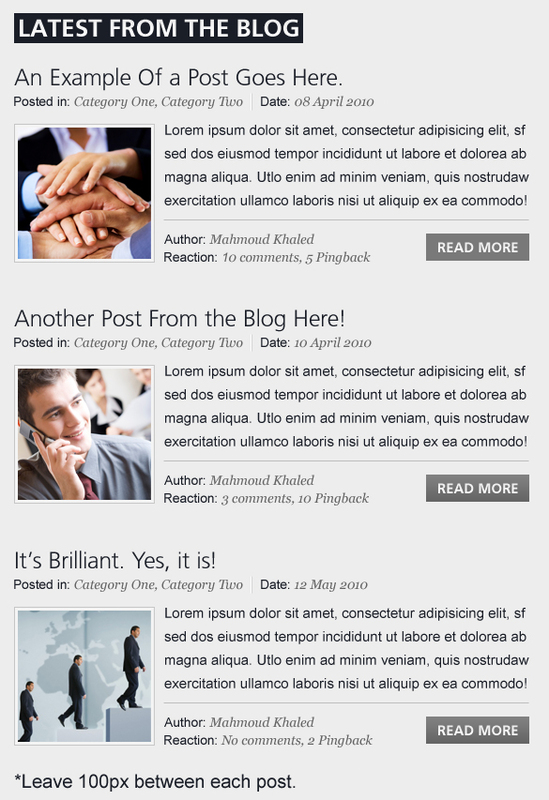 I assume the blog headers will change and be generated dynamically as the blog is updated. 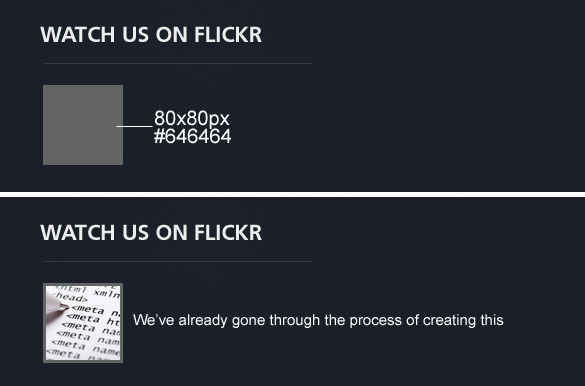 So how will each blog header be rendered on a live site when the font used is Frutiger (not a system font…)? great tutorial, thank you very much. Nice Article, Thanks for this – I would love to take it to the next step and see how it gets pulled into Dreamweaver and made into web-standard code. PSD to DW would be an excellent topic. Very nice tutorial. Would love a tutorial on how to convert this into a website using HTML and CSS. 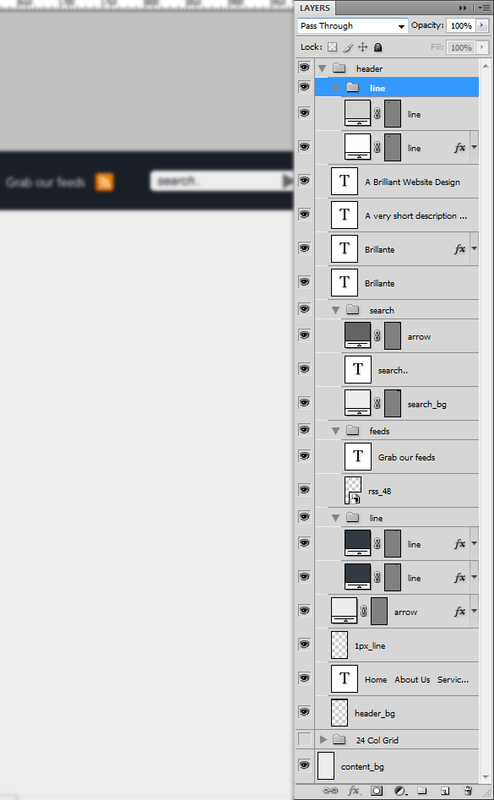 Also, it would be great if you could tell us how to make a WordPress layout with this. Is there a WordPress theme for this? Thanks a lot for your comments guys! Concerning the HTML/CSS part, I think Jon Philips — the founder of SpyreStudios — may be working on this part. 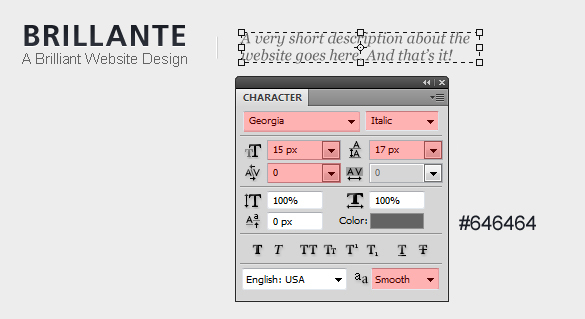 beautiful and really professional website design tutorial. awesome! 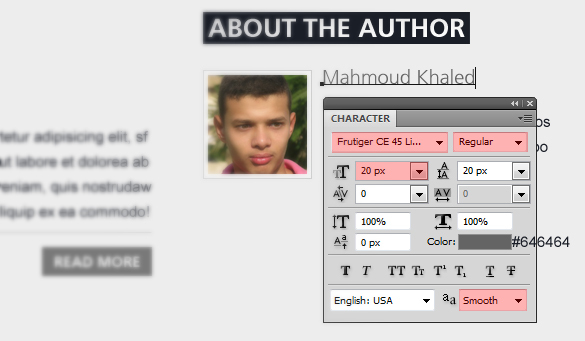 im also lookin forward to DW or CSS tutorial from here…kep it up! Nice and pro. Waiting for HTML and CSS. Maybe not so easy to convert. Amazing tutorial! I was just wondering, how did you make a link for all of the buttons? really amazing…perfect…all the details presented..a very good work! Great site and nice post. 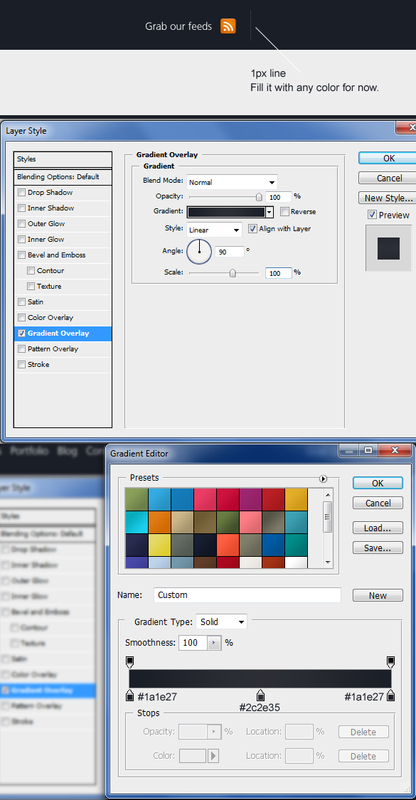 I was intrigued at your gradient pallet, could you post a link to where you downloaded those from, or if you created them it would be awesome to have them as a pallet. 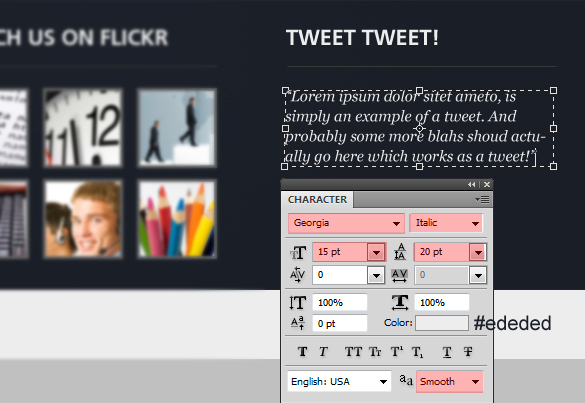 Really looking forward to seeing the HTML/CSS or WordPress version of this tutorial. Great work! Really thank you for this handsome tutorial!!! Guys, I’ve been working on the HTML CSS from this PSD file. Take a look there at my Github repo. Still a lot of work to do. 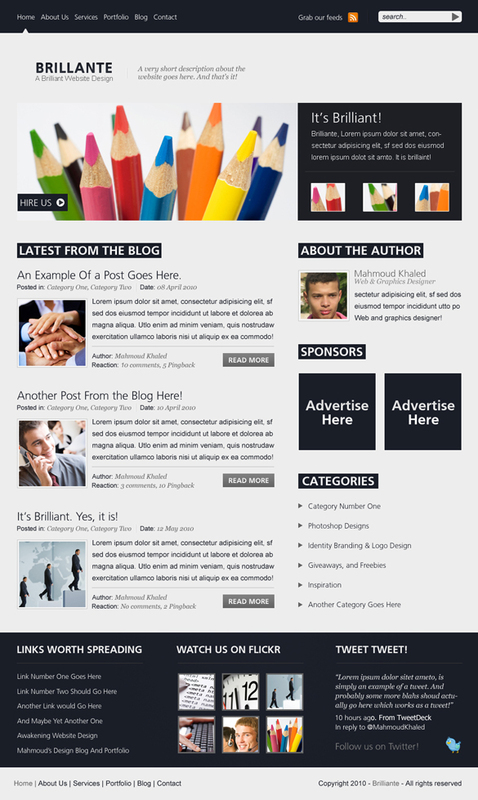 I plan writing a tutorial on how I got here and how to create a WordPress theme with it. Very cool website layout. It could be one for me. Maybe I modify it for using this one for my own needs. Currently, because I need really much a website layout or maybe the idea behind. 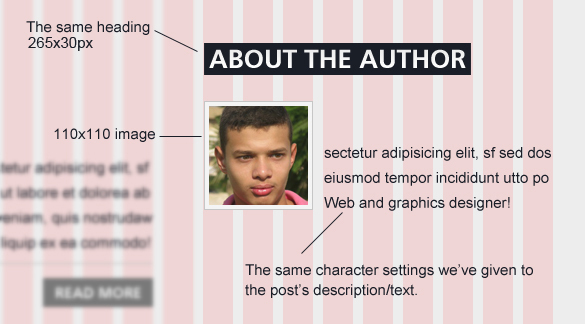 And with this useful tutorial you wrote for us -your readers- I’m able to create my own one for free. Thanks very much for your tutorial. helped me realize that it isn’t that hard, just the mentality that denies you!